Despite the unconvincing weather, spring has arrived. Spring is a far less formidable season than winter, making it a prime opportunity to inspect the conditions of the gutters on your commercial property. With improved weather conditions and extended hours of sunlight, it is imperative that you take this opportunity to assess any damage made during winter and keep up to date with general gutter maintenance. By completing gutter maintenance work during spring, it reduces the risk of expensive emergency gutter cleanings and repairs in the buildup up to winter. For what to expect from your gutters post-winter, and how to tackle your gutter spring cleaning, follow our top 5 points. This year, the UK has been subject to one of its toughest winters. Strong winds and heavy snow has resulted in a considerably damp season. Consequently, it is likely that your gutters could be harvesting rot, mould and various other items of debris swept up by the wind. This combination of harmful materials can cause serious blockages, resulting in the reduction of gutter efficiency. Not only this, but the weather has allowed prime conditions for rot and mould to build, which can impede gutter strength, making fixtures loose and therefore harmful to those at ground level. Whether are not your gutters are showing signs of damage, it is recommended that a professional gutter cleaning is completed post-winter so that any concealed damage is discovered and rectified. A clogged gutter can be identified through internal flooding and stains to external property walls. Clogged gutters are a result of debris and excess foliage, bound together by damp conditions. More often than not, this causes a gutter damn, preventing rainwater to reach the gutter extraction. Similarly to damaged gutters, a blocked gutter is as equally a risk. Over time, the weight of foliage and rainwater can weaken gutter fixtures. Furthermore, without an efficient extraction route, excess rainwater will begin to flow into the property, weakening its structure. To ensure the durability of your gutters as well as the integrity of the structure itself, secure regular gutter maintenance inspections. If the gutters are accessible from ground level of your commercial property, you can perform small inspections to assess whether a gutter is damaged or blocked. The safest inspection you can do is directing a hose towards the roof. 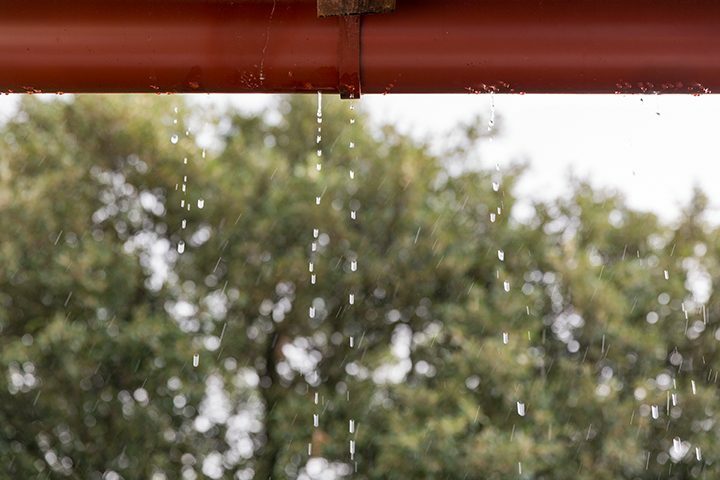 The flow of water will indicate whether your gutters are efficiently removing the water, or if they are blocked or leaking in areas of damage. Any inspections that require getting on a ladder or poses other risks to safety do not attempt. Instead, contact a professional gutter cleaning service who are trained and will have the appropriate tools. The leading cause of damaged or blocked gutters is the build-up foliage and debris. A biannual gutter cleaning service will improve the longevity of your gutters, however, to truly maintain their lifespan, you can put in place preventative methods. To prepare for this year’s winter, it is recommended that you clear any excess foliage at ground level that could be swept up into the gutters. Additionally, you can get splash guards and gutter helmets professionally installed to prevent debris from lodging within the gutters. It is recommended that you schedule a professional gutter service biannually, once during the Autumnal period, and the other immediately after the winter season. Therefore, you should have already, or be in the process of organising a professional gutter cleaning. Despite preventative methods, ultimately the most efficient form of ensuring the durability of your gutters is a professional gutter cleaning service. Those in this profession are trained to handle the terrain where commercial gutters are located, as well as have the tools to reach them. This will also prevent harm to yourself or others attempting to complete gutter inspections themselves. OUR NATIONAL GUTTER MAINTENANCE AND REGULAR GUTTER CLEANING SERVICE IS SECOND TO NONE! IF YOU’VE GOT A PROBLEM WITH YOUR GUTTERS THAT YOU’VE BEEN AVOIDING GIVE US A CALL ON 01748 835 454 BEFORE IT’S TOO LATE. STILL NOT SURE WE’RE THE ONES TO CALL? CHECK OUT OUR CUSTOMER TESTIMONIALS HERE.